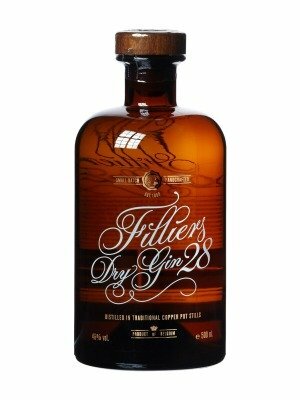 Filliers Dry Gin 28 is a popular Craft Gin available from DrinkSupermarket.com in 50cl to buy online. Visit DrinkSupermarket.com for the best price for 50cl of Filliers Dry Gin 28 or compare prices on our other Craft Gin products. Filliers is a small batch Belgium Gin that is made using 28 different botanicals.Notes of mixed peels off with the cental creamy juniper developing. Hints of coriander, cardamom perfectly complement this to create a warming dry gin. The Filliers family have a history of distilling Genever in Belgium that dates back to the 1800's. More recently, they've applied their skills to producing award-winning gins in a variety of expressions. With 28 botanicals in this gin, it's incredibly versatile! It brings any tonic to life, but try this in your next Negroni! Where to buy Filliers Dry Gin 28 ? Filliers Dry Gin 28 Supermarkets & Stockists. You can buy Filliers Dry Gin 28 online in most retailers and find it in the Craft Gin aisle in supermarkets but we found the best deals online for Filliers Dry Gin 28 in DrinkSupermarket.com, Amazon.co.uk, and others. Compare the current price of Filliers Dry Gin 28 in 50cl size in the table of offers below. Simply click on the button to order Filliers Dry Gin 28 online now.